We added a new report in Towbook for Cancelled Calls. You can set a date range and see a listing of your cancelled calls, including the reason each call was cancelled. See below for an example of the new report. You can access the new Cancelled Calls Report under Dispatching Reports. Today we released an update to our motor club feature that supports processing of calls emailed by Quest. Quest recently began emailing calls (instead of faxing) and we can now accept those emails for customers using our motor club feature. When Quest emails a call to you, it will automatically be added to Towbook and will create a new call instantly. Thanks again for all the great feedback and suggestions – please keep them coming! Today we added the ability to void payments in Impounds, making it more convenient to make a change without having to leave the Impound page. To void a payment, simply click the Void button to the right of the payment ID. 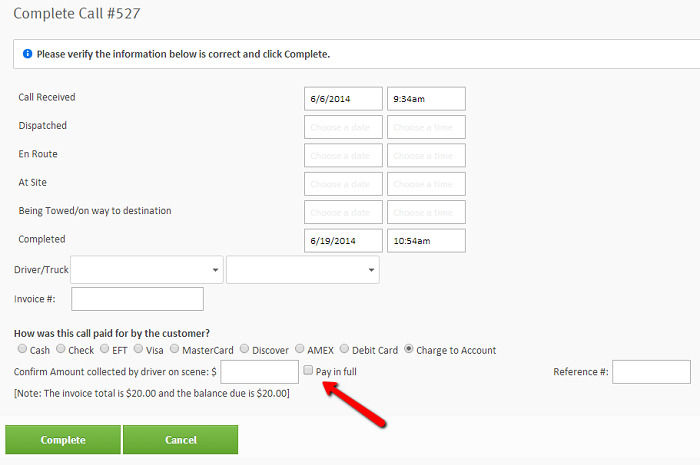 You now have the option to choose the option to pay in full when you complete a call in Towbook. When you go to the complete call screen, simply click the check box for pay in full and the total amount due will get added to the payment box. See below. Listed below are a few of the updates we’ve released in Towbook over the past week. You can now click on an item in the Truck Expense Report to see all the individual expenses. Updated the graph for the Call Analysis report, correcting a date range filter problem. Added column sorting with an arrow to indicate which column the report is currently sorted by (for most reports). The call search filters were updated for Scheduled Calls, expanding the results to include the scheduled date and the completion date of calls. Any uploaded files or receipts can now be viewed on the expense screen. We updated the delete expense option to make it more usable. Towbook now tracks every time you send a receipt to your customers. You can view the history (list) of emails sent for each call by clicking on the call in Dispatching and then clicking on Email (see below). You can now add pricing rules for your accounts in Towbook, saving time and eliminating the chance for forgotten charges. This new feature makes it simple to automatically include invoice items on calls created for specific accounts and reason codes. Pricing rules can also be set up to automatically add charges after a period of time has passed – for example you can automatically add an Admin Charge to impounds that have been in storage for more than 2 days. Today we released a customer notification feature in Towbook. This new tool will help keep everyone aware of updates and important information about the Towbook, including new features, system alerts and great product reminders. Today we released the ability for users to include files that have been uploaded to a call when emailing receipts or invoices from Towbook. You can simply click which files you want to include when you send the email to automatically include them in the message. Listed below are a few of the changes made in this latest release of the Towbook Android App. 1. We completely redesigned the status update screens, making it much easier for drivers to update the status of a call. The new status screen also captures and displays the status times and makes selecting the next status easier by pre-setting it for the driver, eliminating another click.